England are riding on the crest of a wave after a terrific World Cup and bookmakers expect the Three Lions to build on the success from Russia when they face Spain. Who will score against La Roja? Coral are offering a huge 25/1 Harry Kane anytime goalscorer! Anytime goalscorer betting is one of the simplest wagers to place in sports betting. You’re essentially backing a player to score at any point within a match. Naturally, when it comes to England, Harry Kane is the obvious choice among the possible goalscorers. Don't miss the chance to make a £25 profit by staking just £1 on Harry Kane to score a goal! Coral offer 25/1 Harry Kane to score a goal against Spain + £5 free bet! Open a new account with Coral before the kick-off (7.45pm UK Time) and claim 25/1 Harry Kane to score a goal in the 2018 UEFA Nations League match against Spain - What a tasty price! Get 50/1 for the Three Lions to win vs Spain with Betfair! New Customers can get England at an enhanced 50/1 to beat Spain.. Max Stake £1. Winnings paid in free bets, valid for 7 days, only deposits with cards/Paypal count. Exchange and multiple bets excluded. T&C’s Apply. 18+|Gamble Aware. 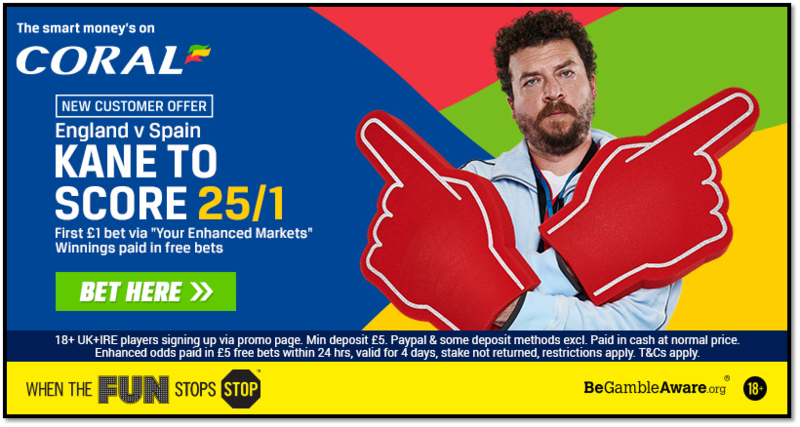 Ladbrokes offer 28/1 England to win vs Spain + £5 free bet! Harry Kane’s stock rose even further at the World Cup when he won the Golden Boot award. The Tottenham striker has scored 14 goals in his last 13 games for the Three Lions. La Furia Roja conceded three goals to Portugal and two to Morocco at the World Cup and we’d not be surprised to see Harry Kane on the scoreline here. "Harry Kane anytime goalscorer" is normally backable at 7/5, so this 25/1 price boost is a great offer! Coral are offering all new customers an insane price of 25/1 Harry Kane to score vs Spain, click here to get your crazy boost in less than two minutes! Max bet at boosted odds is €/£1. Exceeding stake will be paid at normal odds in cash. Ladbrokes offer 25/1 England to score a goal vs Switzerland on Tuesday! "Harry Kane to score vs Spain @ 25/1 + £5 free bet at Coral"